If there was a prize for most-often-served Sunday dinner, spaghetti would win at our house. It’s simple, quick to throw the sauce into the crock pot before Sunday School, and pleases almost everyone. Not only that, it serves a big crowd (or makes a good amount of leftovers for other uses). Sure, you can open a jar of sauce and heat it up, but homemade spaghetti sauce is easy to make and tastes much better. We have the blessing of living next door to our church in a rather rural setting since we moved a year ago. Because of our location, it’s easier to eat Sunday dinner at home than to go to a restaurant but it does require planning ahead. Crockpot meals are nice because they can be started early in the morning and I don’t have to worry about food burning or drying out. Tip: Buy ground beef in bulk, brown it in batches in a large skillet, then freeze in quart-size freezer bags. It’s ready for convenient use in spaghetti sauce, chili, tacos, casseroles and soups. Brown the hamburger/sausage in a skillet and drain the grease. Place in a large 6-qt. crock pot. Add the tomato sauce and puree. Sprinkle the rest of the spices and sugar on top, then stir to combine. Cook on high for 4 hours or low 6 hours. Serve over cooked spaghetti, top with grated parmesan cheese. Also makes a great pizza sauce (with or without the meat), and as an ingredient in Pizza Tot Casserole. We usually have garlic bread and salad as companions to spaghetti, and sometimes corn or green beans. A checked table cloth, candles and flowers create a lovely Sunday meal to share with friends. 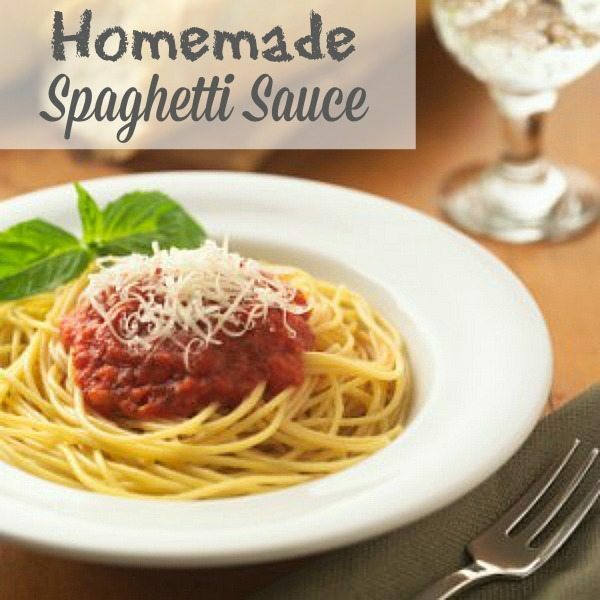 Meals at home are special these days, and spaghetti sauce is an easy way to add a homemade touch. This sounds yummy! I am going to try it!! Thank you, Charlotte!